In the world of traditional Japanese martial arts, kata or fixed forms constitute the essence of technique and guarantee the integrity of a martial system over the course of time. Aiki News editor-in-chief Stanley Pranin joins Yoshinori Kono and one of Japan’s leading swordsmen, Tetsuzan Kuroda, the headmaster of the martial legacy of the Kuroda family, in a disscussion which provides an in-depth glimpse into the concept of kata and the psychology of samurai warriors expressed in modern terms. Editor: As you know, the “Aiki Forum” section of Aiki News is devoted primarily to presenting people outside the world of aikido. I would like to ask you several questions about your family martial arts system. Your first name, Tetsuzan, is rather unusual. Is that your original given name? 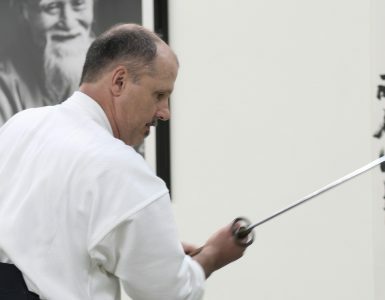 Many aikido instructors attach great importance to the sword. Would you describe the characteristics of your sword training method? 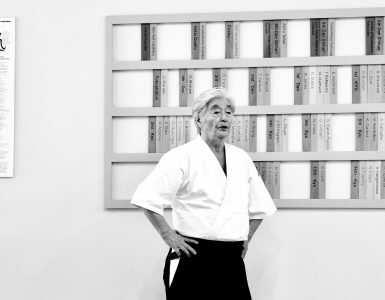 Kuroda Sensei: Since we stress kata [forms] training just as is done in other traditional Japanese martial arts, I don’t think there is anything that can be said to be particularly different in our method. I teach concrete, practical mental and physical techniques to enable students to realize the essence of the art through these kata. 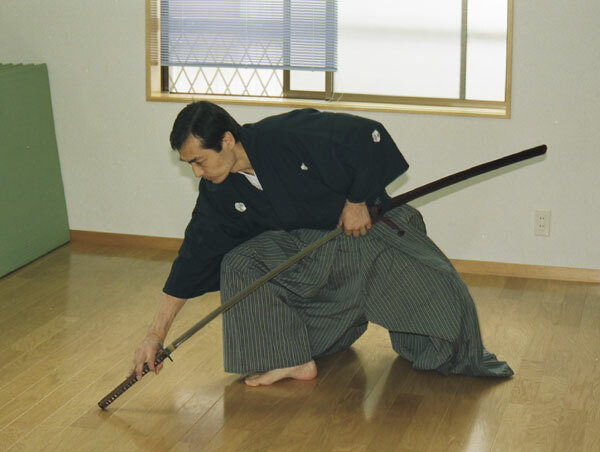 A teaching called zegoku itto no koto has been transmitted in Japanese swordsmanship from olden times. When confronting an opponent one aims for a level where the movements of his mind and body control the opponent before he swings his sword. This is the highest level of swordsmanship. It seems to be a rather abstract spiritual teaching, but that’s not at all the case. It is an “invisible” technique which consists of advanced technical movements and the workings of the spirit based on these movements. All martial arts training begins with learning how to perceive this invisible element. Since the vision of ordinary people is only partially developed, they can only see those things which are visible to the eye. For that reason, people are completely unable to see true things. However, there are also instances when people are able to easily accomplish things that could be considered impossible as a result of knowledge acquired through training. It sounds like a matter of religion if I talk about hearing things which cannot be heard or seeing things which cannot be seen, but please understand that I am referring simply to an individual’s latent knowledge. How was it that you arrived at this way of thinking? 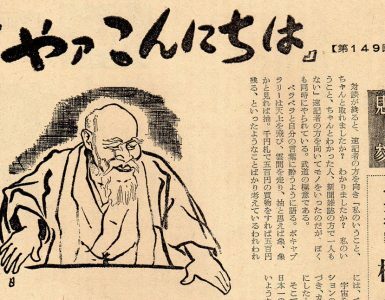 Kuroda Sensei: Previously, I had my doubts that this knowledge was directly related to the martial arts, or that the practice of martial arts kata would enable one to read people’s minds. However, as it is expressed in the writings of my grandfather Yasuji, training in the martial arts is learning how to achieve unity of the sword and body, that is, of techniques and mind. If we ask how to achieve this unity, this answer is through the practice of kata. Everything which the traditional bushi attempted to transmit to future generations is contained in the kata. Through kata training, first of all, our eyes become opened. At the present time I have a fourth-grader among my students. If I control his center line [seichusen], even he is able to clearly see my slightest mental movement and he immediately reacts by withdrawing slightly backward. He hasn’t been trained to concentrate his consciousness on any kind of spiritual training to see invisible things. He has simply practiced jujutsu and kenjutsu kata together with us. Naturally, the mental and physical development of this boy is still immature. However, he is learning kata with eyes that are capable of seeing. In his practice he is conscious of what to do in the kata and how to move which part of his body in order to develop effective technique. It doesn’t matter that he is a child. This is very different from learning a kata form as merely a refined, traditional movement or learning it exactly as one is taught. Therefore, during training at my dojo I begin teaching how to understand the kata and how one should understand each individual movement. We study why the kata have become what they are, why they must be done that way, what we are hoping to achieve by doing the kata, and what will result from practicing them. Isn’t that what the samurai of old were seeking and what they devoted their lives to? Kono Sensei: First of all, I think one of the characteristics of training at Kuroda Sensei’s dojo is that his understanding of the role of kata and the general understanding of kata in the martial arts world is quite different. I believe that from the Mejii period until modern times, including before World War II, kata were considered to be a substitute for actual combat. However, it is important to recognize that a person’s body doesn’t always move as he wills it. After understanding this, it is these kata that free you to become able to move in a technically correct manner. Nowadays, our understanding of kata is extremely vague. Therefore, Kuroda Sensei’s ideas will, I think, be of great interest to people involved in aikido. Kuroda Sensei, do your thoughts concerning kata derive from the classical martial arts or are they uniquely your own? The kata which were transmitted to me—for example, the kenjutsu kata—are not like what one sees commonly these days where the opponent waits, exposing his head, neck, and body, and where one strikes his stopped sword. I may be stating it inappropriately, but in simple terms, that kind of swordwork is just a flashy display. The instant the sword and body of my opponent move, my sword has already cut him through. If you think about it carefully, isn’t it obvious? No one would actually stand and wait for his head to be cut. The kata I was taught were to be practically applied. If you failed to parry the opponent’s sword, his sword would strike your body. When I was a boy and asked someone to be my uke—even when I would ask him to strike slowly—his movement was so fast for someone like me that I was quite tense. Originally, kata training with a partner was conducted in a world where you didn’t get a second chance if you couldn’t parry the attack. It was a world where you couldn’t offer excuses and say, “Let me do it again,” if you made a mistake. Doing things properly in martial arts practice is exactly the same as behaving properly in modern society. Learning not to repeat mistakes or not to offer excuses in kata practice is to have absolute confidence in your own techniques, abilities, and skills. Although that level of confidence might appear to be the maximum for your present level, it might be considered a low level if it is viewed relatively. Such absolute confidence is necessary at all levels of martial arts training. In other words, you must completely trust in yourself. There is nothing other than what you can do yourself. That’s how my father would explain things to me when he raised me. It is possible to perform kata training alone. When your ability has progressed to the point that you can no longer see bad points in your movements, you ask a senior to teach you by receiving your uke. Then you can advance to the next level and the next. As a result the kata becomes faster and faster. Movements executed at a speed visible to the eye become invisible and a speed involving no movement evolves. A gradual change in the ability of your eyes to see and the quality of your movements occurs as you continue to progress in kata training. This is why the samurai were able to stake their lives on it. I take a common sense viewpoint with respect to these kinds of kata. In other words, I believe that kata are not substitutes for actual fighting. If there were such a thing as kata that can be used in a real situation, I would like to see them. I think that it was in this sense that Morihei Ueshiba O-Sensei used to say that one should not attach too much importance to kata. However, this is something that only a man of his stature, who has already reached that level, can say. We ordinary people would lose all clues about how to execute real techniques if we were to reject the kata. Now, I would like to explain what we are attempting to learn in the kata we practice where the opponent attacks by seizing our lapel and attempts to cut our right carotid artery with a dagger held in his right hand. The opponent comes to cut my neck on the right side with his dagger. In this situation, the movement required is to avoid his attack by withdrawing my right shoulder while remaining facing toward the opponent without breaking my center line. Are these the principles which were taught by your grandfather Yasuji? Kuroda Sensei: Yes. If you watch the movement in a mirror you will understand clearly too, but if you see it happen this way it doesn’t at all seem that I have avoided the attack of my opponent. Here, what will happen if I move my body to avoid the attack by tilting to the left and I offer the explanation that the movement of the kata did not actually avoid the attack? If this should happen then what was transmitted by my grandfather would be lost. The kata, which were handed down by bushi who said that jujutsu is so fast as to be invisible to the eye and that throwing people was as simple as taking off a haori [Japanese half-coat], would be destroyed and disappear. What I am trying to explain here is the essence of the method for avoiding an opponent’s attack. Usually what happens is that only the hips and upper body turn and it is not really a movement where one draws back the right shoulder. In the beginning everyone is a beginner. It’s normal for the shoulder not to move. The purpose of the kata is to cause you to realize that you do not move. In this initial movement you must first learn to “open” your right shoulder and right chest. Moreover, you have to learn not to turn either shoulder. Under such conditions, it is normally impossible to do this movement. It’s exactly the same when you change from right hanmi to left hanmi. You need a body manipulation technique because you shift your body while in a turned position without having turned your body. In this manner, just by watching the first movement, you understand that no one at the start can execute the technical movement to handle an opponent’s thrust. If you avoid the attack to the left without understanding this principle, this is not avoiding the attack but merely getting out of the way. Even if you move according to the kata, in the beginning you turn both shoulders, and you are not able to move the right side of your chest. However, if you understand the meaning and practice the movement required, you will eventually grasp the principle transmitted from olden times that the person who first initiates an attack will always lose. An understanding of the qualitative difference between avoiding the attack by opening your body and “getting out of the way” is of incalculable value. If a person moves according to the kata without understanding what the forms are really trying to teach, the practical aspect of the theory that one always wins if the opponent initiates the attack will be lost. The movements of drawing back the right shoulder and drawing or opening the left side of the chest are based on shifting the hips relatively to the right or left. Opening the right side of the chest without pushing out the left shoulder, and moreover, shifting the body without turning either shoulder, that is, shifting the body in a straight line along the center line is an important movement which can be used directly in jujutsu or iajutsu. You are more quickly able to develop an inner eye through continuous practice of each individual movement in this kind of kata while communicating with your own body. Since in this kind of training the use of power is absolutely prohibited, you learn to move in a relaxed manner as is suggested by the term yawara [softness]. Your progress will be greatly slowed if you put power into your movements. After training in this manner, one of my students, who had practiced no-contact karate from junior high school through university, said one year after enrolling, “Up until now I thought that the punches of professional boxers were fast, but the other day when I saw a bout for the first time in quite a while, I couldn’t help but think that the punches really looked slow. I wondered why they were so slow.” This was his opinion of the movements of professional sports compared to the standard of the traditional kata. I spoke about this earlier, but people’s eyes can hardly see true things. They can’t tell what is fast or what is slow. I teach the kata slowly. Even when I do the movements of the kata slowly, they are unable to see them. True speed is not a question of fast or slow movements. Kuroda Sensei: As long as we are talking about martial arts, it is necessary to preserve this kind of body and mind movement. Also, you can regard this as a technical problem. It is exactly the same in iai. How is it that I win while seated holding my unsheathed sword at my waist in a situation where an opponent has already drawn his sword and is about to attack me with it? It’s not at all persuasive to say that this is possible because it is an iai kata, and you absolutely cannot stake your life on it. Since this seems to the normal eye like a situation where my opponent is already fifty meters ahead in a one hundred meter sprint, one would think that there is no chance of winning. Generally speaking, a technique where the opponent is sent flying “when one merely extends his hand” is considered to be a secret technique, but it is nothing more than slightly extending one’s arm in an unusual movement when the opponent is mainly executing normal movements. That type of movement where you lightly extend your arm will have no effect on someone trained in true martial arts. Indeed if one doesn’t strike with full spirit one is risking his life. There are always more advanced techniques, and this cannot be understood at all from the standpoint of common sense movements. However, from the standpoint of someone who has trained with a complete understanding of techniques from the beginning, everything will seem natural. It will simply seem to be the result of accumulated training and the degree of training. The kata are what lead one to this level. After I met Kono Sensei, I too tried to study the subject of realistic iai techniques in July of 1991. I did not do this as a kata but adopted a standing position. Then my opponent struck me at will from the seigan [stance with sword aiming at opponent’s eye] or jodan [upper] stance with a bokken or shinai. To state my conclusion first, I can win as long as my opponent strikes first. Until I had done this, I believed that I couldn’t react fast enough when I imagined my grandfather as my opponent. I used to think that I would end up getting cut every time, and also that as long as an opponent had already drawn his sword, it would be impossible to handle his attack in time. However, I realized by doing this practice why I managed to react in plenty of time. This led me to understand a great many things. I was then able to make progress in my training. The combative distance [ma] I originally thought it was necessary to adopt was the so-called “disappearing form” [kiesareta katachi]. I then had to change to the next step which was the nukitsuke [split second it takes to draw and cut the sword] distance. When I practiced this with my students, the speed of the attack was irrelevant, and I could win easily. This was only because I had developed the eyes to see the movement of the opponent’s spirit. This inner vision is, in Kono Sensei’s words, a spirit of technical dimension called rapport or telepathy or the working of the brain—I can’t find the appropriate words for this. Did your grandfather think about kata in a similar way? However, since at that time I had not developed an inner sight enabling me to see invisible techniques, I felt a strong admiration for that kind of kata form. That still hasn’t changed. When I wondered what true forms were, I imagined they were indeed what my grandfather and great-grandfather practiced when they were young and earned their menkyo [licenses]. In any event, I think that the reason I am what I am today is that the kata have been preserved in an unaltered form up to the present. Did your grandfather actually show you the kata himself? Kuroda Sensei: No. When he began correcting me after I had started training here seriously, my grandfather was already in his last years and so he mostly taught me orally. 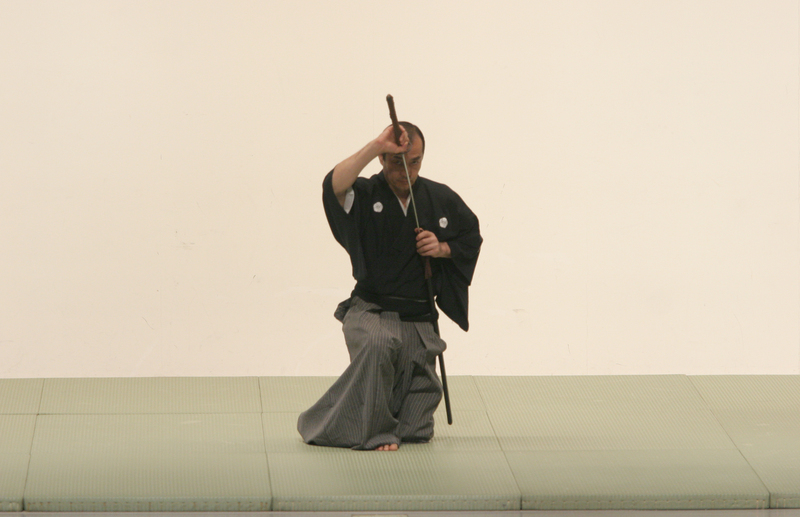 As a result, about the only times I was able to see his movements was when he gave an outside demonstration. Even that was only about once a year. But, even though I say “see,” I tried as hard as possible to understand his invisible movements which I couldn’t grasp since I lacked the true ability to see. I was unable to see the essence of his movements even though he showed them to me so clearly. I desperately tried to understand his movements, which would not have been diffcult if I had known the kata. He didn’t even draw my attention to the fact that I was overlooking the essence of the techniques. In other words, my grandfather regarded training in a different light than we do today. He recognized only things he could see as visible. Earlier I talked about my student who considered the punches of professional boxers to be slow. His perception was the same as my grandfather’s. One time my grandfather was watching a professional boxing match and he commented, “Oh, look at that idiot sticking out his face and waiting to be punched!” On that occasion, I wondered what level of perception he had developed to be able to judge someone who could punch that quickly. Now I finally understand what it was he was talking about. A stopwatch cannot measure the speed of techniques for someone who has been born and raised in a world where no movement is the fastest kind of movement and speed cannot be measured by instruments. Techniques, or rather what can be called techniques, are fast in absolute or divine terms. Those techniques are the kata themselves. In the example of the jujutsu kata I gave earlier, the opponent first strikes to the neck. The speed of this strike cannot be perceived by the normal eye because it is executed in a single-rhythm. I say “true speed,” but even when this strike is executed relatively slowly it is the same; it is somehow fast. You get the feeling that it is indeed fast and it is a speed which cannot be avoided. However, if you execute this movement with a motionless body, the movement becomes as slow as the speed with which it is executed. Only movements which are absolutely fast while moving slowly are true techniques. It is impossible to avoid this kind of technique or strike without inward eyes if one actually executes these movements quickly in a single rhythm. Training exchanges for the purpose of researching techniques and practice among different teachers is not common in the aikido world, but you and Kono Sensei have engaged in training exchanges. How did you happen to meet Kono Sensei? Kuroda Sensei: Kono Sensei wanted to observe my practice and that is how he first came here. Kono Sensei: That was in May 1983. When I visited, we spent from six to about 10:30 p.m. in a small restaurant talking about things, including episodes about his grandfather, Yasuji Sensei and the latter’s father, Hiroshi Masakuni Sensei, and I forgot all about the time. Then, the following month I was invited to the first traditional martial arts demonstration of the Saitama branch of the Dai Nihon Butokukai association. Kono Sensei: Still, the night I visited was quite a shock for me. If I had merely been told exciting tales, I might only have listened half-heartedly since there are many such stories, but I sensed an authentic quality in Kuroda Sensei’s way of talking and a power which was different from what a person would feel simply hearing stories from his grandfather. I was really overwhelmed. Then it was after that experience that you began training exchanges with Kono Sensei. Kono Sensei was the one who made me realize that. The difference between being soft and merely not using power is seen when the time comes to try to move and the technique either works or it doesn’t. Also, you really have to train seriously over a period of time in order to become soft when not using power. You can’t do it all at once. Kono Sensei showed me several kirikuzushi techniques each time he came to the dojo. In these techniques he allows himself to be grabbed with two hands and I even had him teach them to my students. Later, after hearing my story about my grandfather taking forward falls thirty-six times on the length of one tatami mat, he said that he first began training with the goal of taking two falls. When he told me this over the phone, following his lead, I began the same training. When I tried at that time it still took about seventy percent of the length of the tatami for me to fall, just as it had until that time. The only hint I had was the words of my grandfather I had heard as a boy. He said, “Roll forward and try to put your head into your crotch!” Is it that easy to put your head into your crotch? Since he was not talking about having a particular degree of body flexibility, I couldn’t figure out how to roll. Once, when I was absent from the dojo, my grandfather became disgusted at the sight of my students doing stiff jujutsu training and he showed them how to roll, saying that they could not even roll properly. On that occasion, it seems that my grandfather, who was dressed in a heavy-quilt garment, happened to take a fall. When I asked my students how he rolled they just said that they didn’t know and so I had no clue. All they said was that he needed only a distance of about twelve inches to do the roll. I recorded my progress in this ukemi over a period of time on videotape. I have fond recollections of my improvement. After beginning around the start of May 1988, when I could do two forward rolls, it went quickly: May 26—three times; May 29—four times; May 31—six times. Then, in June, the pace was as follows: June 3—eight times; June 9—twelve times; June 12—eighteen times; June 14—thirty-seven times; June 19—forty-three times. I don’t roll in this ukemi. My leg doesn’t strike the floor either. I came to understand gradually after I tried to do it. Kono Sensei: I was truly amazed at his enthusiasm for training and the speed of his progress. In our training exchange in February 1989 his movements still felt jerky, but four months later in June, he could execute the movements smoothly and it felt as if you were being pulled into his technique. It was like a white belt progressing in four months to fourth or fifth dan in another martial art. I would like to have Kuroda Sensei explain here in detail how he reevaluated his family jujutsu, known as Shishin Takuma-ryu, and about the so-called invisible movements. Kuroda Sensei: My exchange training at that time with Kono Sensei really caused me to study hard. My students didn’t understand how they were becoming unbalanced, nor did I understand anything except that my execution of the kata which had previously been rigid had now become soft. 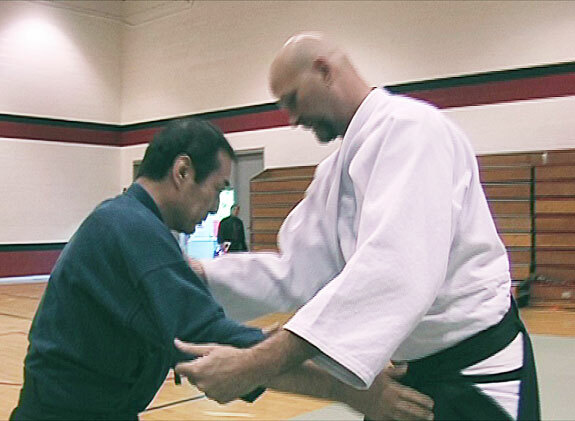 At that time, Kono Sensei was taking falls for me and was able to “read” my body movements. I remember that listening to him was just like hearing an explanation of Kono Sensei’s movements rather than my own. This exchange training with him provided an opportunity to practice observing my movements in detail. After that, my students, who came once a week, said that every week the training was changing. It continued to change so often that students who always came even said that it was different each class. I set aside kenjutsu and iajutsu and did nothing but jujutsu. I felt as if I was catching up in a single stretch on the jujutsu in our curriculum that I had up until then avoided. If I became soft then my partner became soft and both of us seemed to try to compete to remove power from our movements.However, as always, I executed the kata as they were handed down unchanged. Little by little, one after another, the kata forced me to face a new level of diffculty. The very same kata constantly changed as I was changing and this gave me no time even to consider attempting to alter them. When I understood how to unbalance uke’s hips even when I grabbed his soft hand which had no power in it, I realized that I had come to develop an inner sight before I was conscious of it. The sharpness of my technique improved as I trained relying on this inner vision and I gradually began to use less and less power. Then I had Kono Sensei look at my techniques and that proved to be the best study and validation of what I was doing. Soon after that my students started saying they couldn’t see my movements. I first thought that they were saying something to the effect that they couldn’t see my movements because I executed them quickly in a single rhythm. At that time—the situation is still the same—because there was no one more advanced than me and I couldn’t see the actual movements of a more advanced person, I asked a lot of detailed questions of my students such as, “How was the movement I just did?” or “How is this?” and I was completely dependent on their ability to perceive invisible things. Then the students, who in the beginning had responded that they didn’t understand, became able to see. Little by little they became able to point out the details of the distortions in my movements. I thought to myself how helpful if would have been to have someone of at least my level to show me the same movements, but that too is a matter of fate. My training progressed especially during that period when I had my students watch my practice every day. They told me that my movements were invisible. Just after they enrolled they said that I was fast, but my later movements were invisible to the eye compared to my earlier way of moving. They said that they could only understand the beginning and end of the movements. Soon, even when I would move unintentionally they would say they couldn’t see it. I said, “Really?” and asked which movement was invisible. Naturally, when I did the movement looking in the mirror, since I was moving consciously it felt fast and I actually experienced it as being fast, despite the fact I was watching deliberately. At that time, I was actually able to experience for the first time what are variously referred to as “disappearing movements,” “speed invisible to the eye,” “divine speed,” and such things. However, when I actually did this kind of fast movement in practice, even ordinary people could tell it was fast, but it was a false speed like that recorded with a stopwatch. The speed of a true movement is not like this and the beginning and end of the movement are almost simultaneous. Therefore, when I do the kata at normal speed or slowly, my students and people who are capable to some extent of seeing these things can understand the instantaneous changes in the true movements and say they are both fast. On the contrary, when I exert myself to do a movement attempting to show a bad example to beginning students, the same people say my movements are slow. However, beginners are the opposite, as I mentioned earlier, and can’t tell what is fast and what is slow. In any event, I was finally able to understand that original jujutsu was fast enough even to cope with the sword. Therefore, I now understand the role of atemi [strikes to vital points] in jujutsu. When your opponent is someone without inner sight, you can execute an atemi on him to any vital point without being parried. I am very pleased that this way of using the body exists and that I can execute these techniques to a certain extent. From this example, I can say that punches and kicks in jujutsu should be cultivated through the kata practice of the original jujutsu. Kono Sensei: Of course, I think this is something shared by all arts including kenjutsu and iajutsu, and does not include only jujutsu. Also, I think Kuroda Sensei’s progress in jujutsu is related to the fact that he trained for a long time starting as a boy with Yasuji Sensei in an art which incorporates the use of weapons. Kuroda Sensei’s sudden progress in jujutsu proves to me what I have been insisting on for a long time. That is, martial training which incorporates weapons such as the katana is an extremely important factor in qualitative improvement in taijutsu [empty-handed techniques] and I am very pleased at this. I was really surprised at Kuroda Sensei’s rate of progress. Since improvement in jujutsu techniques is naturally related to an improvement in kenjutsu and iajutsu, I believe it is an ideal kind of progress for martial arts training. Now, as Kono Sensei has mentioned, it is true that at the time I was engrossed in training in the kata of my family tradition there weren’t very many students. As a result, I practiced kenjutsu and iajutsu kata by myself. Particularly, in iai, I would practice drawing the sword over and over, but I couldn’t do it. I couldn’t master the sword-drawing technique. I could see myself that something was wrong. Even though I knew that I was doing it wrong, there was no one to teach me how to draw the sword correctly. My grandfather would occasionally come into the dojo and watch me, but in the beginning he would make comments such as, “Your hips are too high,” or “The movement of your left hand holding the scabbard [okuri] is too slow.” However, after a while he stopped saying anything. Once, when I was doing the okutachi technique in kenjutsu I could feel the heaviness of my body. The more I tried to move quickly, the more resistance I felt at various stages. Then he told me with his usual smile, “Your training is not bad, but…” I wanted to know how to clear the next obstacle, but his words were cut off with his smile.You often hear the word tanden [center point just below the navel] mentioned in the martial arts. However, since I was struggling with the kata, the hardest aspect of training, I never was conscious of this concept even once during training. That’s true even today. Generally speaking, we see many people who end up getting too stuck on the concept of tanden because they are too conscious of it before they are even able to move their bodies freely. Now, after I begin to feel a sense of lightness due to the buoyancy of my body and my body movements seem to disappear, it feels like there is nothing from my neck downward. At the same time, there is something I realized in February 1992 when I stood before a mirror intending to practice suburi [sword-swinging practice]. When I took a stance, my hips were really low, and again I felt the “lowness of my hips” as if they were sinking. Then, when I looked at my stance from the side, I realized that my abdomen suddenly pushed outward slightly. At first, I thought that I had a slight paunch, but then I realized what I had discovered and I smiled in satisfaction.